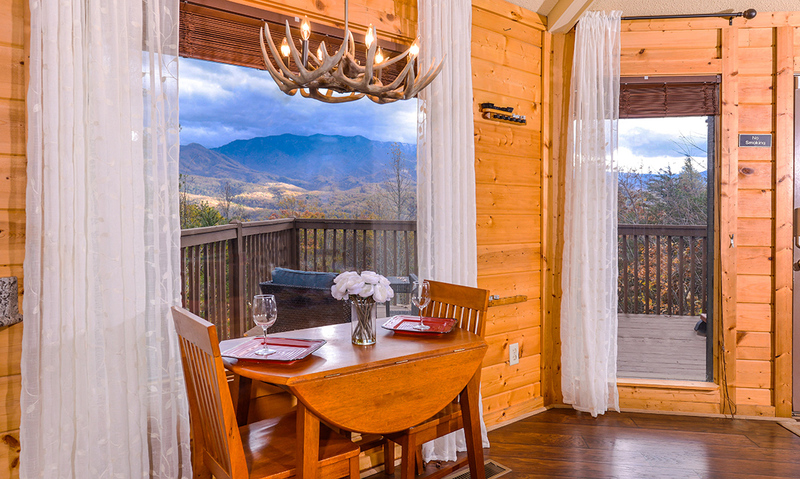 Fall in love all over again in the incredibly romantic atmosphere of Apparent Seclusion, where beautiful modern design perfectly pairs with laid-back mountain cabin living. 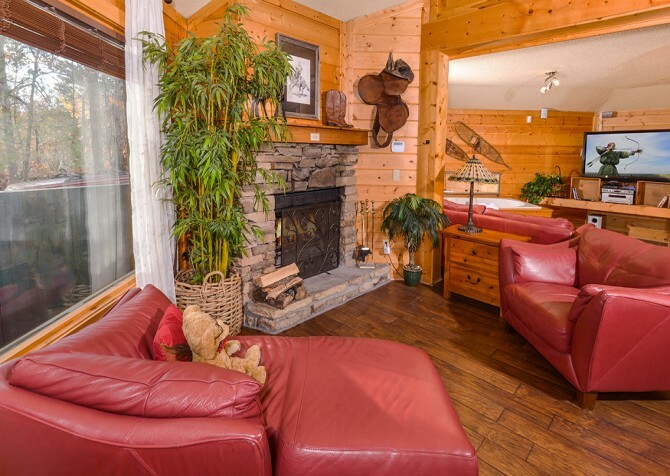 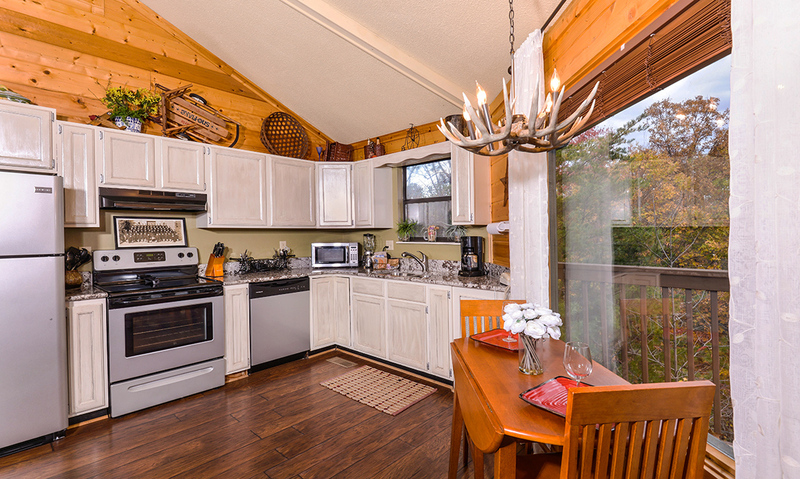 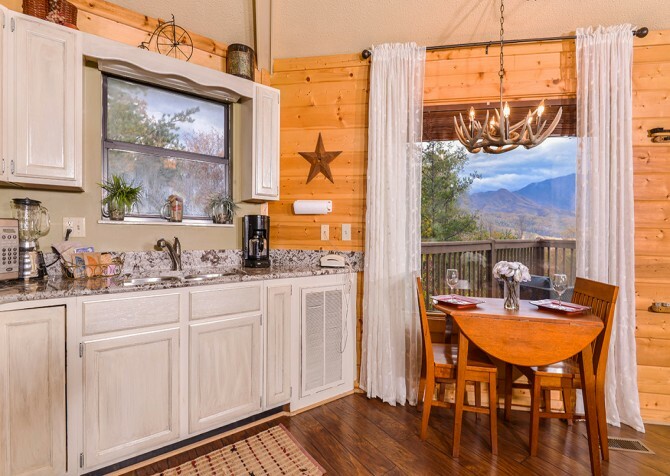 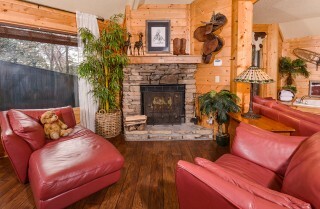 Escape to this gorgeous 1-bedroom cabin built for 2 and enjoy quiet seclusion in the Smoky Mountains while conveniently located only a few miles from the iconic city of Gatlinburg, Tennessee. 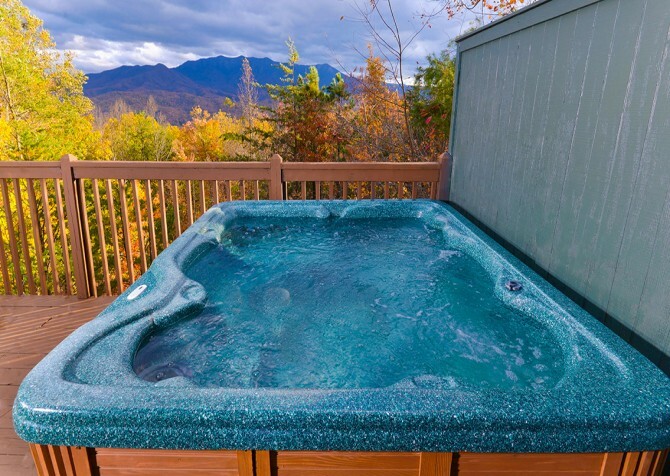 Revel in the incredible views of mountain skyline while sipping morning coffees in the cushioned deck dining set, unwinding in the bubbly waters of the outdoor hot tub, and dining under the rustic antler chandelier. 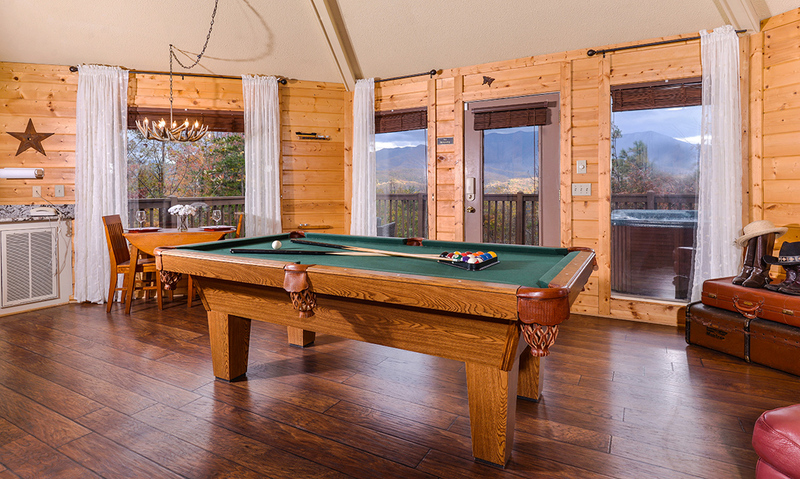 No need to leave the cabin for entertainment with a full-size pool table to play while enjoying glasses of local wine from Smoky Mountain Winery and a large flatscreen TV to watch movies while lounging on the plush leather couches. 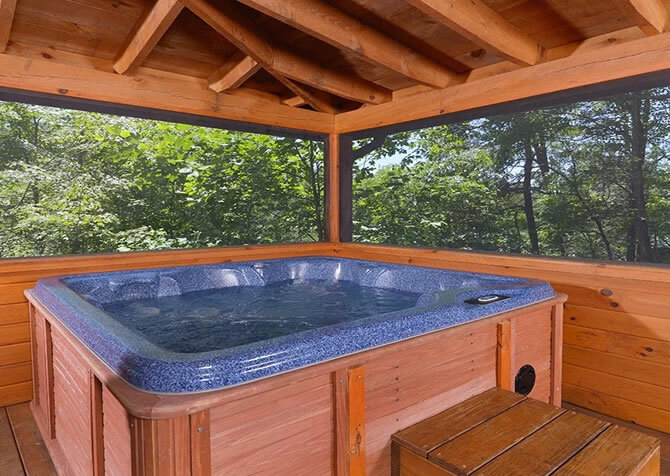 On warm, sunny days, slip down to the community pool to soak up some sun and cool off in the waters trickling down from the lovely waterfall accent. In between savory meals at the numerous delicious restaurants in downtown Gatlinburg, impress your significant other with homemade meals from the fully loaded kitchen and dining in your own private romantic ambiance with wistful white curtains, a lovely dining set for 2, and gorgeous Smoky Mountain views through large windows. 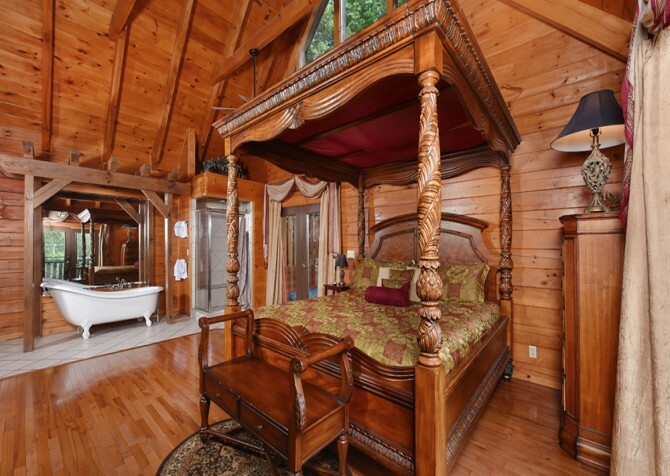 After exploring exciting Gatlinburg attractions like the Rocky Top Wine Trail, the Great Smoky Arts and Crafts Community, and The Village, come home to restful nights of sleep in the master suite’s impressive log queen-size bed. 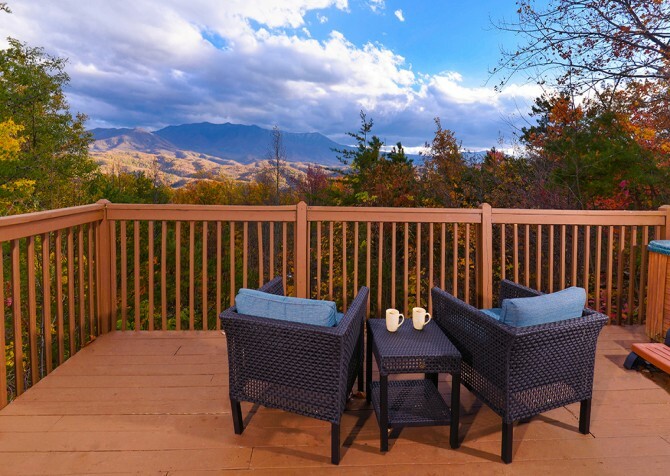 With so much luxurious comfort and privacy and hundreds of Smoky Mountain attractions only a few miles away, Apparent Seclusion is your next dream vacation awaiting. 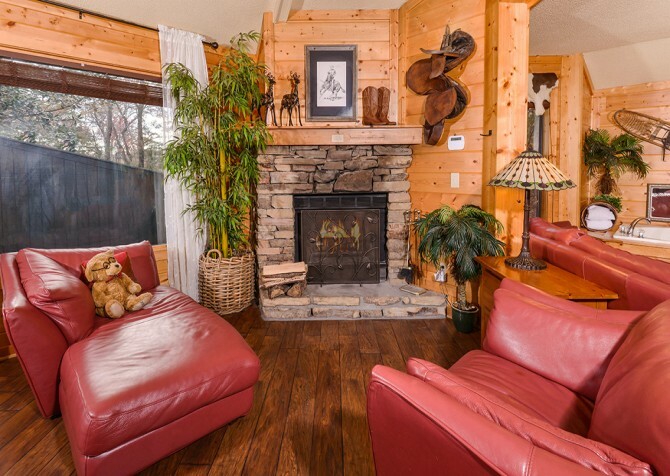 Sink into the plush leather couches with cups of hot cocoa or glasses of wine to enjoy a quiet evening by the fire before turning in for bed each night. 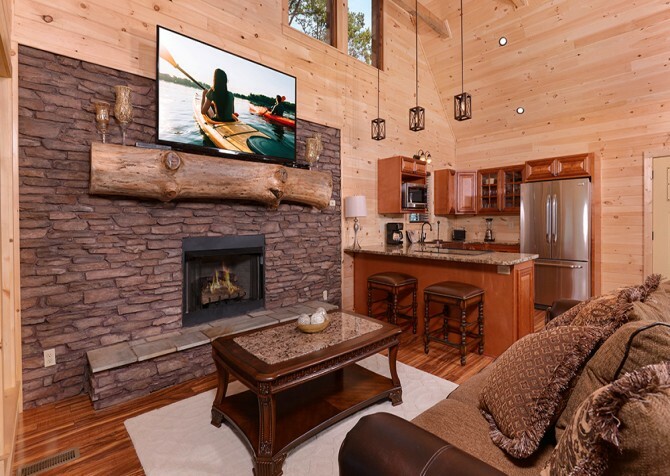 With ample natural light pouring in through the open-concept cabin, lounge on the couch by the windows with a good book or listen to your favorite podcast while streaming on your smart device connected to the cabin’s wireless internet. 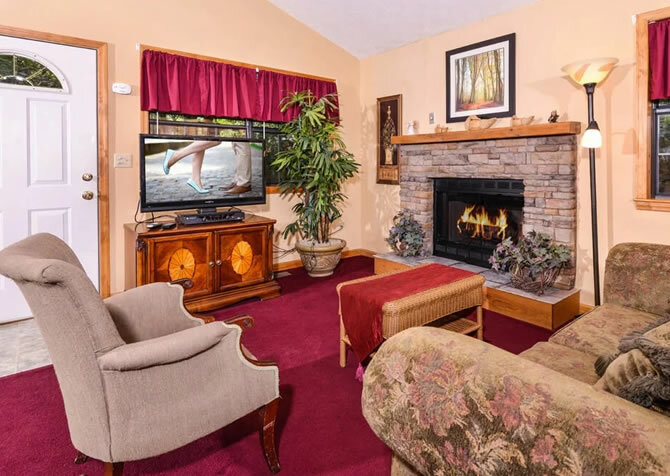 With the crackling of the wood-burning fire beyond the stone hearth and the low music playing on the CD player, unwind and reconnect with your special someone in the warm light while seated around the stone fireplace. 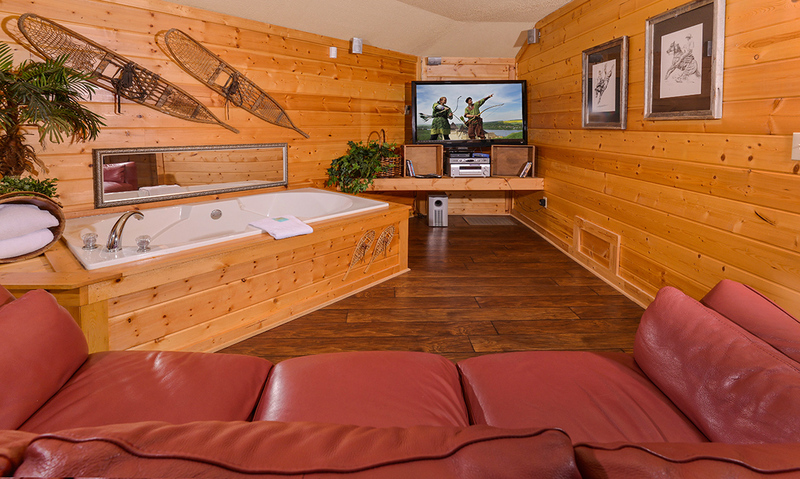 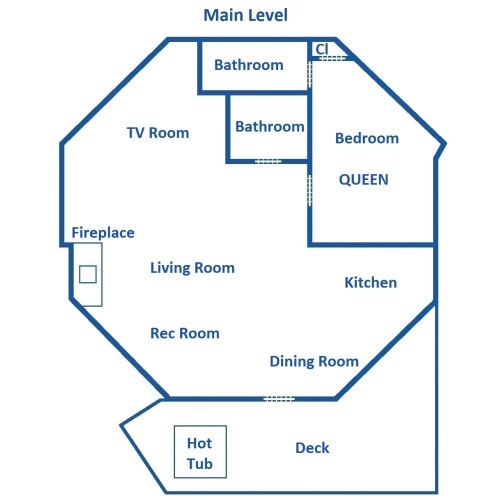 Bring your favorite DVD movies from home and pop them into the DVD player and enjoy a late-night movie on the large flatscreen TV while cuddling on the leather sofa or from your soothing seat in the large indoor jetted tub! Gorgeous off-white cabinetry, sparkling granite countertops, and sleek stainless-steel appliances beckon guests to cook more meals while staying in Apparent Seclusion! 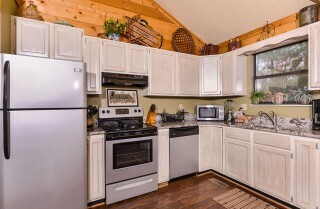 Bond with your loved one while putting together a multi-course meal using every necessary cooking tool and utensil conveniently stocked in the cabin. Bring home leftovers to store in the full-size refrigerator and reheat quick snacks in the microwave to hold you over in between meals. 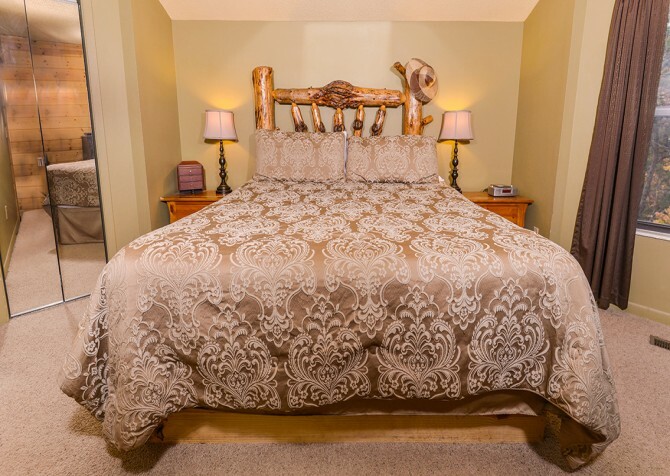 Surprise your special someone with breakfast in bed complete with a fresh cup of coffee in the coffeemaker or a fruit smoothie using the blender. 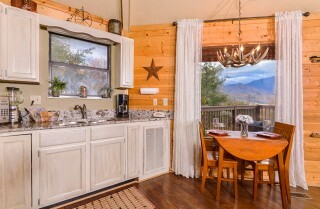 Just the right size for 2, the lovely dining room of Apparent Seclusion makes every meal in the cabin a romantic occasion. Settle into the wood 2-chair set for a peaceful breakfast in the morning daylight while majestic mountain views rest through the large windows with dreamy white curtains. 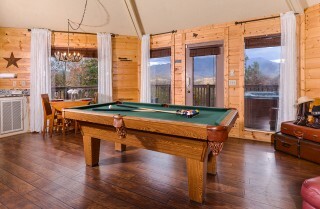 Use the table’s hinged additions when multi-course meals grow too large for the dining space or while playing your favorite large board games from home. Set the mood with the wispy white curtains drawn overlooking incredible views of the mountains at dusk and the warm light of the antler chandelier hanging overhead before serving up cabin-made meals with a dancing fire beyond the stone hearth nearby. 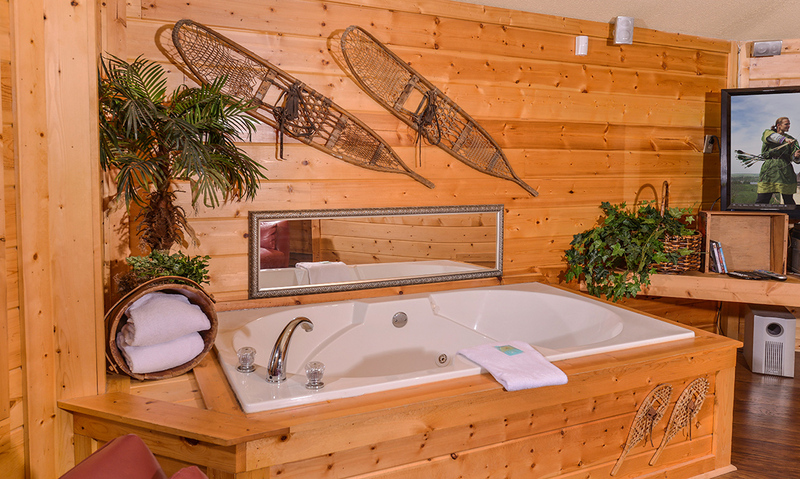 Settle into divine rest in the cozy atmosphere of the master suite after adventurous days of hiking or exciting trips to downtown Gatlinburg for plenty of rest each night in Apparent Seclusion. 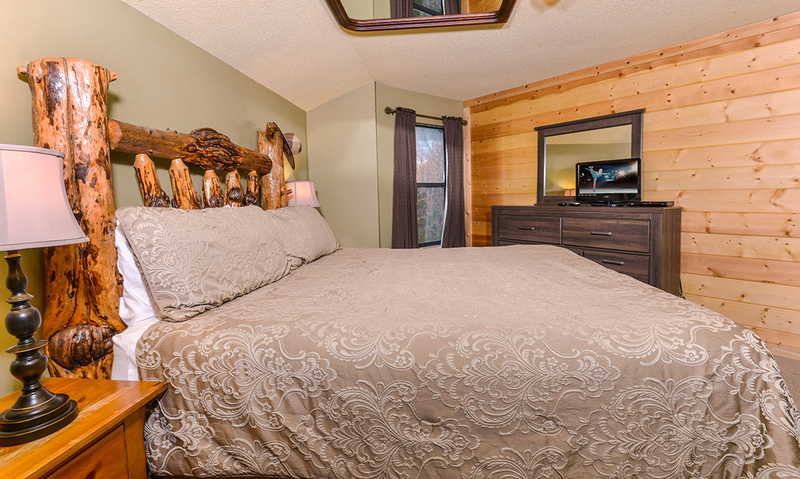 Pull back the covers of the queen-size log bed and begin enjoying late-night TV on the flatscreen or finally finish the last chapter of your book before drifting off to sleep in the soft light of the bedside table lamps. Unpack suitcases into the large mirrored closet and vanity dresser to easily find outfits for each romantic outing and exciting excursion. 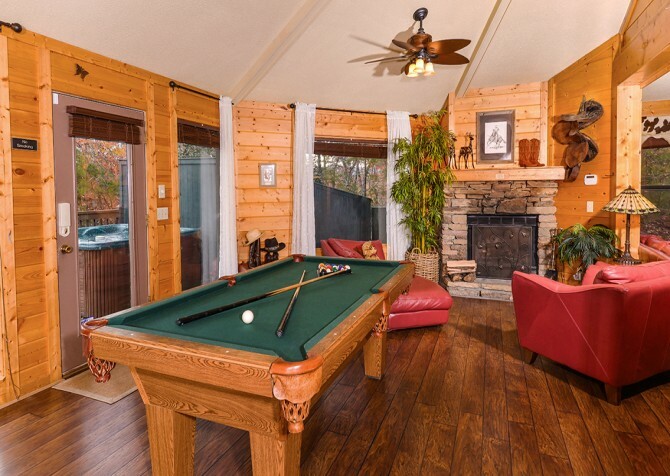 Bring home a bottle of your favorite wine along the Rocky Top Wine Trail and spend fun evenings in the cabin sipping on glasses of your favorite white or red wine while shooting pool on the cabin’s full-size recreational room while a romantic fire burns in the nearby fireplace. Practice your trick shots before hitting a night out on the town while your loved primps or enjoy a flirtatious night of billiards in the cabin after dinner each night. 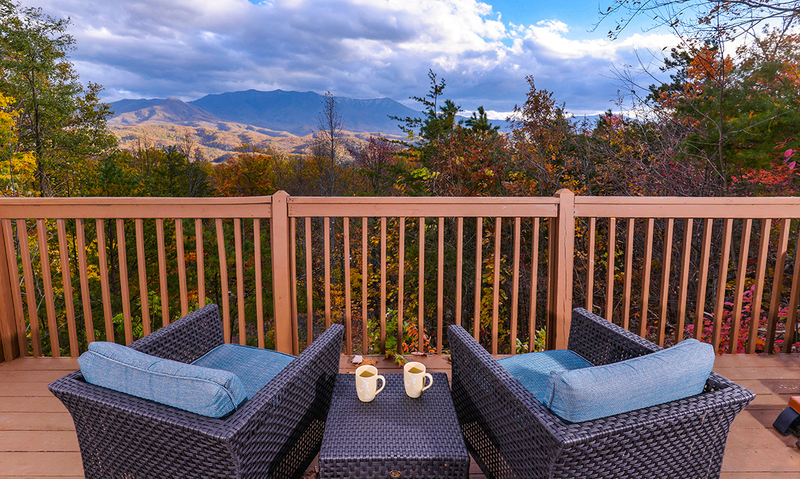 Savor every sip of freshly brewed coffee while soaking in the incredible mountain views of the Smokies right from your deck’s cushioned seating. Watch dusk slowly turn to night as the first stars appear of the mountainous horizon while unwinding with your loved one in the bubbling, steamy waters of the outdoor hot tub. On hot summer days, cool down with a swim in the gorgeous community pool of the Condo Villas, complete with ample pool-side seating and relaxing waterfall accent. 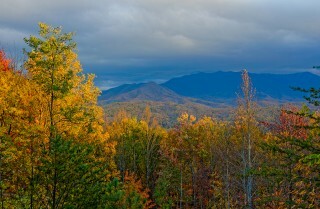 Discover the best of Smoky Mountain Wine country where you may have not even known there to be a wine country in the South! Visit 3 or all 6 of the participating local wineries for tastings, tours, and gift shops and earn a FREE souvenir with your stamped “passport” from each location! 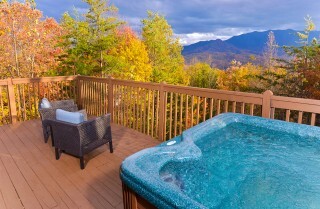 Take the plunge hundreds of feet in the air this anniversary or honeymoon for the experience of a lifetime! 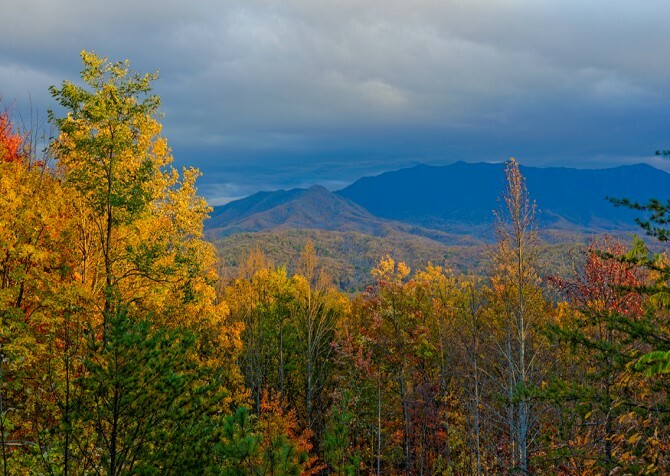 The views of the Smoky Mountains are unparalleled from the plane and it only gets more exciting as you take your leap and soar to the landing pad! 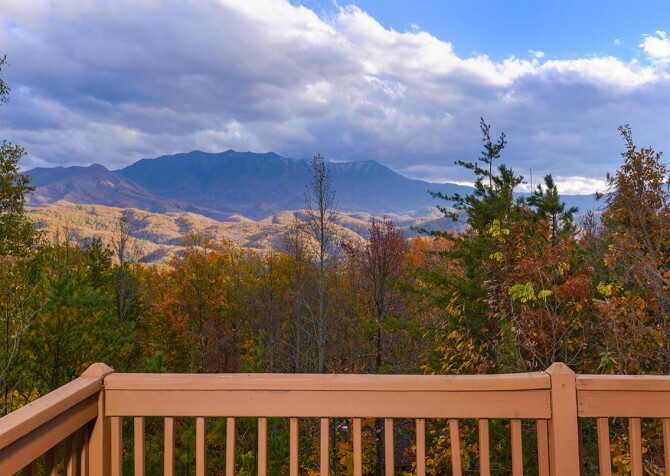 Tour the beauty of the forests, rivers, and valleys filled with wildflowers on a laid-back horseback ride with any one of the Smoky Mountains reputable riding stables for a relaxing afternoon with gorgeous scenery. "We had an incredible trip and absolutely loved our cabin Apparent Seclusion!!! 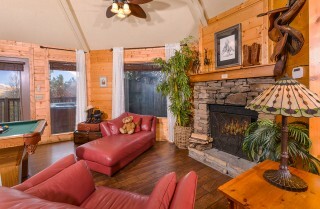 The inside is basic but who needs to be inside with that view from the porch!! Highly recommend!!"